New Delhi, January 25: India is on the way to becoming the fifth largest economy in the world, Prime Minister Narendra Modi said on Friday. 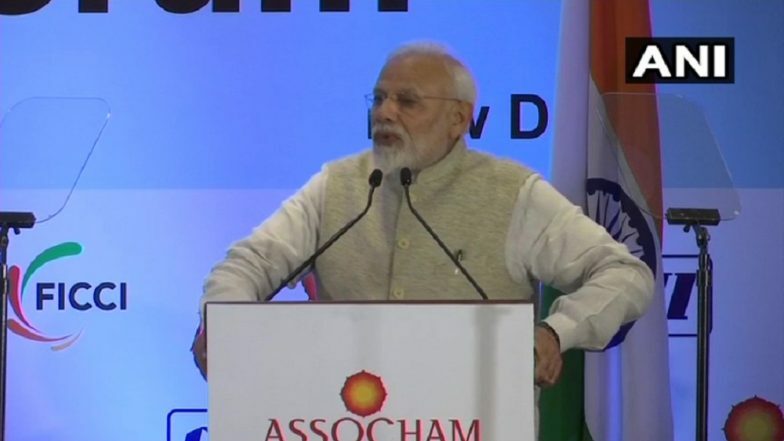 He was addressing the India-South Africa Business Forum organised jointly by Indian industry chambers CII, Ficci and Assocham in the presence of visiting South African President Cyril Ramaphosa. Modi also noted that India had risen to 77th place in the World Bank's latest Ease of Doing Business rankings and is currently among the most attractive destinations for foreign direct investment (FDI) according to UNCTAD. "We are on way to becoming the 5th largest economy globally and have jumped to 77th position in the World Bank's Ease of Doing Business rankings," he said. 'How’s The Josh?' PM Narendra Modi Quotes Dialogue of Film 'Uri: The Surgical Strike', Gets This Response. According to the projections released earlier this week by British consultancy multinational PwC, India is likely to surpass the UK in the 2019 rankings of world's largest economies, knocking the latter from fifth to seventh place in the global table. Speaking of India's bilateral trade with South Africa which crossed the $10 billion-mark in 2017-18, the Prime Minister said simplification of the visa regime between both countries, as well as improving air connectivity, would contribute much to boost the trade relationship. He said there is considerable scope for increasing bilateral trade in the gems and jewellery sector, for instance, through direct procurement of diamonds which would "help improve economies of scale and reduce costs."